Hey everybody, it's Truffles! Earlier this month I blogged about February being Pet Dental Health Month and I got to try PetSmart's exclusive Authority brand dental treats. Then Chewy.com asked if I would like to review some Greenies dental treats, and of course I said yes. Why limit yourself to one brand of treat when there are more out there to be savored and enjoyed? Feline Greenies Dental Treats have a unique teeth-cleaning shape that helps prevent the buildup of plaque and tartar accumulation on kitty teeth, while cleaning and freshening breath. Made with a natural formula with added vitamins, minerals, taurine, and chlorophyll for optimum feline health, each treat is only 1.25 calories and contain no artificial flavors or preservatives. They come in 6 flavors: Oven Roasted Chicken, Ocean Fish, Savory Salmon, Tempting Tuna, Catnip and Succulent Beef. 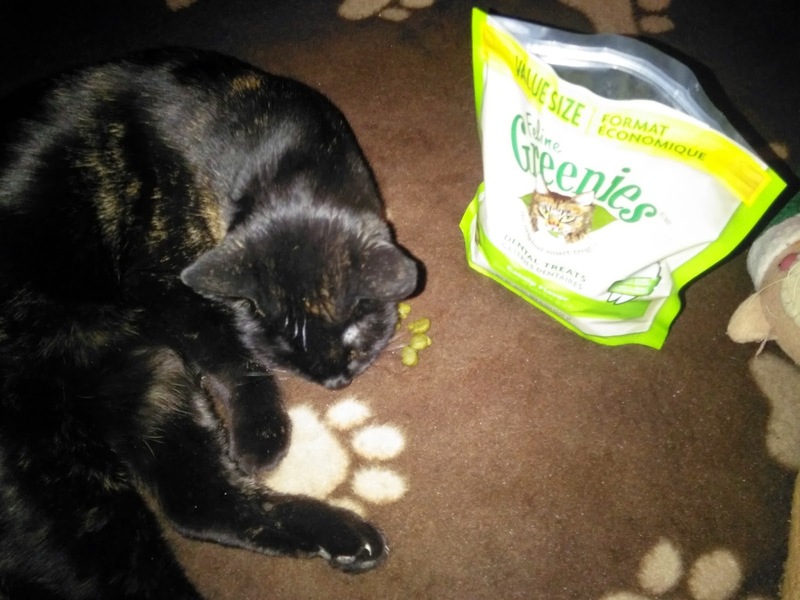 Greenies are the only cat treat to have The Veterinary Oral Health Council Seal of Acceptance for tartar reduction. Usually when I make a treat selection I choose chicken or turkey flavors, but this time I decided to shake things up a little and request the new Catnip flavor. I am SO glad that I did...these treats are absolutely delish!!! To think such yumminess is also good for my pearly whites is just icing on the cake! If you're not shopping at Chewy.com, you really should give them a try. They have distribution centers around the country and if you place your order by 4 PM eastern on a weekday it will ship the very same day. For orders under $49 there is a flat rate shipping fee of $4.95, but over $49 shipping is free! The value size bags of Greenies (5.5 ounces) are currently on sale, so make sure you add them to your orders today. Those catnip flavored Greenies are DIVINE!!! We do a LOT of shopping at Chewy too. We buy all of our litter from them. Yeah, the FedEx man isn't much of a fan. We keep hearing how yummy these are. We're sending the Mommy out into the cold to get some! We've had those, and they're tasty! Chewy is pawesome to bring things right to your doorstep. Especially inconveniently heavy stuff. Glogirly is right... the fedex guy must not like it so much. 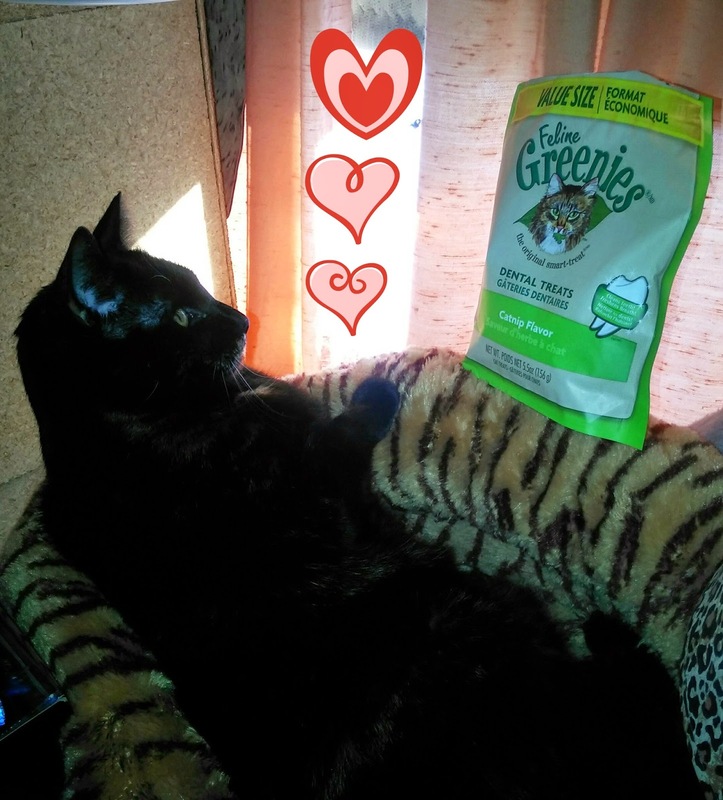 We love our Greenies dental treats! Truffles, you look adorable in your bed. I have never ordered from Chewy, I need to check them out. My cats love the Greenies dental chews. Those treats are great, aren't they Truffles? Jewel liked the Greenies catnip flavor. Carmine and Milita's favorite are the Greenies chicken hairball formula :) Your post reminded me I probably need to get them some more when I go to PetSmart on Friday! We love Greenies!!! They are so yummy. Just wondering...do kitties ingest catnip with these and do they start acting silly afterward? Most excellent review Truffles. We are glad you enjoyed those catnip flavor! Glad you enjoyed them, Truffles! Gasp! Isn’t this a conflict of innerest? Heh heh. I love to play the devil’s advocate cos I got the devil horns. Love those nip Greenies but only from PetSmart. The catnip flavor sounds delish! We can't wait to try them! HIDES! HIDES! Can we hire a new typist? PLEEEZ?